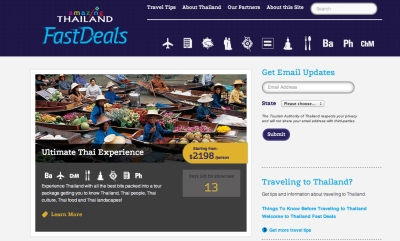 The Tourism Authority of Thailand (TAT) has announced the launch of ThailandFastDeals.com, a new dedicated flash deals site showcasing last-minute offerings from the destination. Created to allow tour operators, hoteliers and wholesalers to promote their unique Thailand offers, the site will give consumers access to travel packages and activities at a discount in Bangkok, Phuket, Chiang Mai and beyond. Thailand Fast Deals include special hotel, flight, tour packages and other perks made available to the TAT by trusted industry partners. Curated directly by TAT to ensure quality and value, offers are priced specially for the site and are available for a limited time only. ThailandFastDeals.com is updated regularly to feature new and exciting travel and vacation packages as well as distinctive and alluring tours. Current offerings include special nightly rates at Bangkok’s Centara Grand Hotel, a three-night Beach Break at SALA Phuket Resort, an 11-day Thailand & The Golden Triangle Escapade Experience, and a special Songkran Festival package at the Four Seasons Koh Samui. For more information or to book a Thailand Fast Deal, visit www.thailandfastdeals.com. For more information on travel to Thiland, visit www.tourismthailand.org/us.